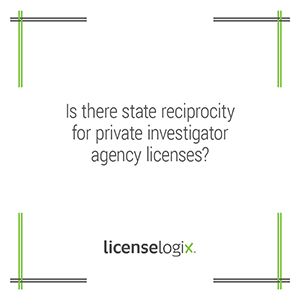 Is there state reciprocity for private investigator agency licenses? There are some instances when a private investigator may work in another state without obtaining that state’s license. These are limited exceptions and in most cases, the agency and agents should obtain the state license. Some states have reciprocal licensing agreements that allow currently licensed private investigators to come into the state for a specific period of time. For example, in North Carolina it is thirty days maximum, except for Tennessee which is fifteen days, to work a case which originated in their home state. Likewise, licensed North Carolina investigators may enter that state to work a case originating there. Investigations exceeding the time limits must be handled by a private investigator licensed in the particular state. See the NC Department of Justice for more on the North Carolina reciprocity laws. Forty two states require private investigator agency licenses. Many local counties and cities have their own license requirements for this industry. Basic business licenses and state business entity registrations may also apply. If an individual or company will be operating in the state on a more long term or permanent basis, they will likely need to obtain that state’s license. The licensing process can take 4 weeks to 3 months, depending on the review by state agency and complexity of application. Common requirements include proof of insurance, surety bonds, and a detailed business plan. Individual investigators and owners of the company must often provide fingerprints, photos, references and employment history so that the state may run a background check. LicenseLogix can help private investigation companies determine the licenses required when moving into a new state. Our services will help your company obtain all licenses and registrations and manage ongoing license renewals and compliance with state and local laws and regulations. For additional help you can fill in the form on the right or give us a call at (800) 292-0909.